Terri informs Darcy that she wasn't on a date, and calls to report her situation. Terri tells Darcy that he has just caused her to loose an entire months worth of work by letting the guy get away. He tells her that had he known what she was doing he wouldn't have followed, but she reminds him that he shouldn't have to follow her on dates either. He tells her not to blame herself, but she informs him that it's him she blames. With the house sale sign very much in view, Evan comes outside wondering why the buyers haven't yet arrived. Matt tells them that they were interested so they'll turn up. He tells Evan that he's made a sign for selling the car, which will hopefully give them some extra money for the legal cost. Without much more to say, Evan heads back inside. Inside, Emily tells someone on the phone that the house has already been sold and hangs up. Maggie tells Evan they'll be able to move in with her parents in Aulbury, but Evan isn't so sure. Maggie tells them they don't have much choice, but Leo isn't too impressed either. She asks Em who was on the phone, but Em tells her it was a wrong number. Libby tries to persuade Drew that moving into Lou's place (his house not the pub!) would be good for them. Drew isn't so sure, with the rent and lease on their current flat, but Lib reminds him that the flat next to theirs was re-let within a week. Libby tells Dee that they'll be moving back into the street, but Drew hurries her away to talk about the money. Stuart asks Dee if she's finished her coffee, but she doesn't understand the need to rush. Darcy arrives, so Chooka/Stu heads off. Rosie pops over to give Harold and Lou some flowers as a house warming present. Harold reciprocates the gesture by offering her dinner. She agrees, but has to dash to go and project manage the gardener at the church. Lou tells Harold that he probably won't be able to join them with the meal, he agrees with Harold that Rosie is very thoughtful, before disappearing off. Darcy admits to Dee that he had a lapse in the trust department and it's ended up causing Terri to end things with him. He comments how he'd like to be friends with Terri, but Dee doesn't believe that it's possible for him to have a female friend without it being anything more. He tells her he's friends with Susan - because it's illegal to be anything more, and it would just be wrong! eugh! - and her. Dee laughs at the idea of them being friends, which causes Darcy to leave in a huff. 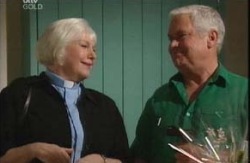 Maggie comes over to say goodbye to Toadie as they'll have moved by the time he gets back from his trip. He asks about her work and she tells him she'll find something, though it may not be legal. She offers him a hug, but he tries to pash her which takes her by surprise. She asks him if he was seriously thinking about helping her take responsibility for her family and finances, and admits that she was wrong about a friendship between them. She heads off leaving Toadie alone. Darcy tracks Terri down and offers her flowers as a way of apologising. She tells him that she accepts the apology but not the flowers as they are only friends, and you don't give flowers to friends. She starts to make a business call so Darcy leaves. Stuart asks Dee for help regarding something to do with Drew and money, but I'm not entirely sure. Dee recons it's a trick, so he offers to tell her plan B. Dee tells him she doesn't want to know, so he disappears. Libby tells Lou she'd love to move in but Drew still isn't keen. Lou tells her she'll find a way to change his mind and advises her on using the back bedroom as a nursery - close, but not too close. Lou takes a call from Rosie, and after hanging up, Libby encourages him to ask her out, as it's clear that there is something between them. Lou isn't so sure on the idea and comes up with excuses, but Libby tells him it's not all one sided. He tries changing the subject by showing her some more little things around the house. Matt and Leo arrive home to find Emily ending another phone call about the house. They realise that she's been interrupting lots of calls which is why no one has been turning up to look around the house. Darcy tries giving the flowers he bought for Terri to Dee, but she is able to tell instantly that she's getting them second hand. Darcy tells her how Terri was annoyed at him, and Dee comments that it's probably best that he's not the rebound man. Darcy turns it around to her and Stuart, but Dee points out that it just highlights his immaturity. She gives him the flowers back and closes the door. Leo tells Emily that he doesn't want to go to Aulbury either as he'll miss his crew, but she can't go telling lies to Evan and Maggie. She tells him that he tells them lies, so he leaves Matt to have a go at persuading her. Matt tells Em that she'll be able to make new friends in Aulbury. Maggie and Evan arrive as Matt tells Em not to blame anyone else but him, as it's entirely his fault. Stuart is holding a baby, trying to collect some money out of a random bloke telling him it's just him and the bubs. The guy gives him some cash, but as Stuart goes to write a receipt he drops the baby, revealing it to be a plastic doll. The guy shuts the door on him. Drew wonders why some people aren't able to pay their garage bills when they make it so easy for them. Stuart tells him he went door knocking that arvo and managed to collect some of the outstanding payments. He tells Drew that the key was in setting the right scene. Libby arrives and tells Drew that she recons they should move into Lou's house. He tells her that his reservations are about being so close to Karl and Susan, but Libby tells him they'll respect their privacy. He admits he's been a bit paranoid, and agrees to the move. Harold and Rosie are talking about Harold's views on bingo and gambling as Lou appears. They invite him to have desert with them, and after a bit of persuasion he admits he could take a break from his work. He sits down and joins them. 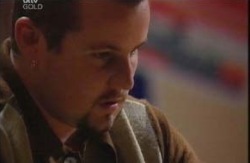 Toadie writes a letter to Maggie. He folds the letter and seals it in an envelope. 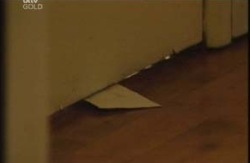 Emily wanders through the hallway as she notices the letter being pushed under the door. She picks it up and puts it in her dressing gown before heading to her bedroom. Matt wanders in and notices the 'For Sale' sign that Emily has placed on her dolls house. Evan appears and tells Matt not to worry. Matt tells him that he was right all the time, if he hadn't bought the car, then none of it would've happened and Harold and Glen would be ok. Matt starts to cry as he blames himself having to leave the house and their jobs. Evan tells him that he's worth much more than all of that to them, and that none of it matters. He tells Matt that they learn from their mistakes and they'll get through it together. Matt breaks down telling his father that he's truly sorry.